During those trips, we would often do something that surprised me. We would watch a movie at a movie theatre. It seems ironic that we were in the vacation/theme park/attraction capital of the world, yet we would do something that we could have easily done back home. It seems like, I don’t know, somehow we were cheating. But we always enjoyed our movie night by the mouse. Somehow it felt special. Perhaps it was the mixture of the old and familiar in new surroundings that made a movie by the mouse seem more special than a movie back home. Obviously we’re not alone in this, as there are many places near Disney World to enjoy a movie. If you are visiting the mouse and want to go out for a movie, here are my picks for where to catch a flick. At the Downtown Disney Marketplace, AMC has a 24 screen theatre. This might prove the easiest place to go, especially if you are staying on Disney property. And with 24 screens, it is a safe bet there will be a movie playing that you want to see whenever you arrive. Major releases show as often as every half hour on five or more screens. There are also plenty of great restaurants, such as Wolfgang Pucks, House of Blues, Bongo’s Cuban Cafe, and Planet Hollywood, literally right outside one of the theatre entrances and T-Rex Cafe or Rainforest Cafe within walking distance. However, it also ranks at the top of my list of worst places to see a movie. I’m not sure why. Perhaps it’s too big and impersonal, perhaps it’s the overcrowdedness, perhaps it’s because it always cost more to see a movie here, maybe it’s because Disney can sometimes feel like it traps you and you want to try something outside the resort. By far, the best places to see a movie in Central Florida are the Enzian Theatre in Maitland or the Tampa Theatre in Tampa. Both theatres show primarily arthouse movies and I will describe them in detail in other posts. The third best place to see a movie is for free–It’s the nightly Disney flick that shows, along with a Chip and Dale sing-a-long and campfire cookout, at the Fort Wilderness Campground in the Disney Resort. Another great movie theatre is the Regal Cinema 20 + IMAX at Pointe Orlando near the Orange County Convention Center. This theatre features not only state of the art theatres and sound, but an enormous IMAX screen that regularly shows first run movies in 180 degrees. Parking in the parking garage can be a pain and you have to remember to validate your parking pass. Having the ticket booth on the ground floor while the entrance to the theatre on the second floor is another annoyance. But these are soon forgotten when you enter the creatively decorated theatre house and snuggle into your seat. The most convenient place to watch a movie is the Regal Cinema’s Stadium Theatre 16 located at The Loop shopping center on the corner of Osceola Parkway and John Young Parkway. Other nice and convenient theatre locations are the 20 theatres at Cinemark at the Festival Bay Mall on the north end of International Drive and the Park Theatres in the Winter Park Village north of Orlando. 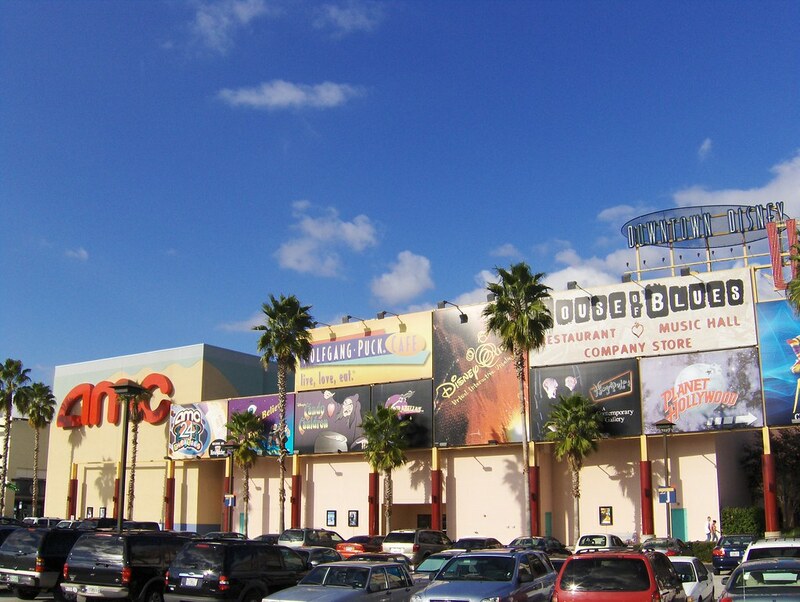 There are also nice movie theatres in Citywalk at Universal Orlando. Like Downtown Disney, there are lots of great restaurants outside the door, but parking is a hassle and costs $12 if you go too early in the day. But the best place to enjoy a movie near Disney World is at one of the two theatres in downtown Celebration. According to rumor, Disney would only give AMC permission to build their 24 theatre multiplex in Downtown Disney if they agreed to build two, state of the art theatres in 1997 in their new hometown. No matter how popular the movie, these theatres are almost never sold out. Right in front of the theatres is a great fountain that shoots jets of water directly from the sidewalk. Kids love to run through the area, sometimes daring to avoid the jets, other times purposefully dousing themselves. All of this on the edge of the downtown lake where you can enjoy quaint shopping experiences, sit on a large rocking chair on the dock of the lake, or enjoy a meal at one of the excellent Celebration restaurants such as The Columbia, Celebration Town Tavern, Market Street Cafe, Kilwin’s Chocolate and Ice Cream, Seito Sushi Japanese, Sherlock’s of Celebration, Upper Crust Pizza, or my personal favorite, Cafe D’Antonio’s. Enjoy your movie and pass the popcorn. This entry was posted on June 2, 2009 at 7:00 pm and is filed under Local Info. You can follow any responses to this entry through the RSS 2.0 feed. You can leave a response, or trackback from your own site. Omg, thank you very much for posting this! It’s going to help me when I am thinking about going to Tampa Theatre in Tampa! I am from Warrington so I am not familiar with Tampa. Next time I visit my family will be much better! Cool!